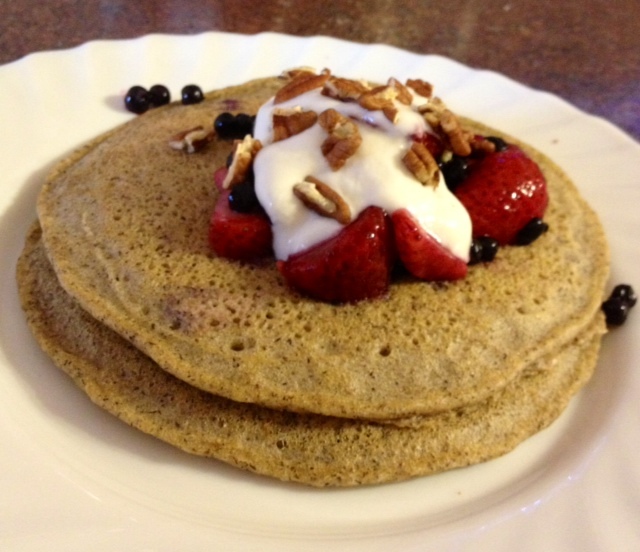 Buckwheat pancakes with berries, pecans and yogurt is one of my favorite breakfasts. I make my own pancake mix and then just add the wet ingredients whenever I want pancakes. They’re so delicious and so easy – two of my favorite things! These tasty numbers are also very filling. The photo is not my suggested serving size! I just wanted to make the pancakes look pretty for you. You can add various foods to the batter to switch up the flavors, or to change the nutritional makeup. For example, some flax meal, chia seeds or nuts would go beautifully in these. You can also add fruits directly to the batter. This recipe comes in two steps, first make the mix, then make the pancakes. 4 1/2 cups of buckwheat flour blend *See notes on whole grain flour blend below. Blend ingredients well, sifting if necessary. Store in a sealed container. Note: you may need to refrigerate your mix, depending on the flours you use. Measure your pancake mix into a medium sized bowl. Pour your wet ingredients over your pancake mix and lightly whisk. Do not over-mix the batter, you want to stir it until it is just blended. Let your batter stand for 5-10 minutes while your pans heat up. Warm your pans to medium-low. Pour the batter onto your greased warm pan or griddle. 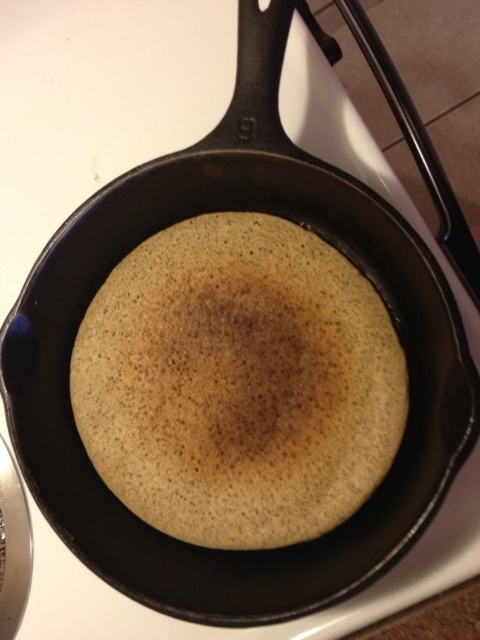 When bubbles form and cover the top of the pancake, they are ready to flip. Do not flip too many times or they will come out rubbery. Once flipped let them cook for approximately 3 more minutes. *I use my whole grain flour blend for this recipe. You can substitute other flours according to your preferences. I mix this blend up in large batches and store in an airtight container in the cupboard then use it for muffins, loaves, pancakes etc. If you do not anticipate going through the mix quickly, you may want to store it in the refrigerator. The ratio of this blend is: 1 cup brown rice, 1 cup buckwheat flour and 1/2 cup of starch (cornstarch, tapioca starch). **Spices such as cinnamon, and nutmeg go a long way with this recipe so be generous. I have never measured so I do not have any guidelines for you. “The nose knows”, as they say. Buckwheat can be a bit of a strong flavor and using this spices can make it more palatable, especially to those new to gluten free flours. The same is true of vanilla, so feel free to add another smidge.